London – Tuesday, 20th January 2015 – With the Christmas and New Year celebrations well and truly behind us, it’s time to get back to the business of professional boxing. For those in London the season starts a little earlier, than in most parts of the country – Friday, January 30th – when promoter Shyam Batra presents his first show of the new year, titled Legends & Prospects, at the York Hall in Bethnal Green. Headlining the event sees Nazeing, Essex’s George ‘Hithard’ Hillyard challenging Czech Republic #1 ranked Super Welterweight Michal Vosyka, for the World Boxing Union (WBU) International Middleweight title. Back in August Hillyard outpointed Ireland’s Tommy Tolan to earn the title shot, whilst his opponent Vosyka went one better in December, with a sensational second round knock-out victory over Czech #2 Michal Dufek. Hillyard, who returned to the sport in March last year after a two year sabbatical from the sport, was clearly determined to make sure that he is a hundred percent ready for the challenge, by traveling to America in November for a twelve week camp at the famous Gleason’s Gym in Brooklyn, New York, in doing so forgoing Christmas celebrations with his family. Support for Hillyard’s title challenge sees a number of the recently rebranded Champions TKO Boxing Gym’s young stars back in action at York Hall. The main support bout for Hillyard-Vosyka sees one of the most exciting young Lightweight prospects, Solihull’s former England Amateur Captain Antonio Counihan, back in action in the Capital City once more. With four top class victories under his belt, three by way of stoppage, Counihan has been shooting up the rankings, so much so that his management is already talking about a domestic title challenge for the highly likeable Brummie later in 2015. Hackney based former Turkish Amateur star Siar Ozgul, steps up to a six rounder for the first time in his fledgling career. With five excellent points victories under his belt already, Ozgul has garnered a huge following, due to his all action pressure style of boxing. Talking of all action pressure fighters, Siar’s older brother Onder, tagged ‘Little Mike’ by the Turkish fans during his time in the World Series Of Boxing, due to his style being so similar to that of legendary Heavyweight Champ ‘Iron’ Mike Tyson, will also be in action on the 30th. Fighting in the Light Heavyweight division Onder has secured three excellent victories, two by shut out points decisions and one by first round stoppage. Making his most welcome return to the fray, following a two year sabbatical from the sport, is another of Champion TKO’s exciting young stars, Bradford’s hugely popular Bantamweight prospect Tasif Khan. Another all action fighter, Khan has fought ten times, winning seven, drawing two and just the single loss, a very close 37-38 points loss to Stuart McFadyen back in July ’07 at Super Bantamweight. 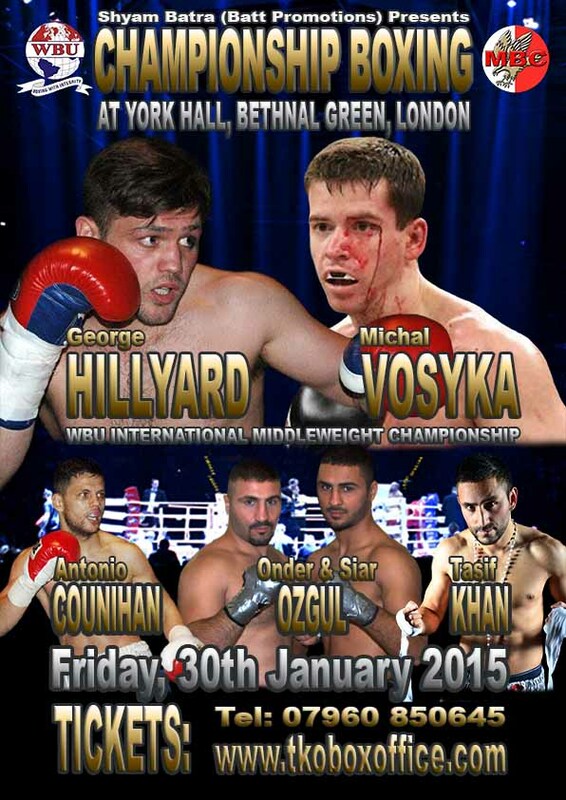 The Shyam Batra promoted ‘LEGENDS & PROSPECTS event, featuring George Hillyard versus Michal Vosyka WBU International Middleweight title clash, takes place at York Hall in Bethnal Green, London, on Friday, 30th January 2015. Tickets, priced £30 (Standard Seated), £40 (Gallery) and £65 (Ringside) plus £2.50 booking fee - are available from any of the boxers taking part, on-line at www.tkoboxoffice.com - or call the box office on 07960 850645 or 07836 365203.